The strap-line ‘a powerful and moving play about the devastating impact of dementia’ basically says it all. The acclaimed French playwright Florian Zeller has captured the internal angst of a terrible disease perfectly, whilst sensitively showing how the other concerned parties are affected. Credit must also be given to Christopher Hampton for a smoothly-flowing translation. The play does not attempt to offer any answers; how could it? Instead perhaps, it enables those of us with no direct experience of sufferers to be a little more sensitive to the condition, giving powerful insights into the complex and varied mental states of victims of dementia. The Father is not just a commentary on a sad decline into oblivion. Everyone, barring misfortune earlier in life, will sooner or later succumb to the inevitable and the play shows a character with a rounded set of human relationships. At times there are elements of genuine humour as we shown that contrary to how he might sometimes appear, Andre is still essentially the person he was. He is even able to effectively mock the way others feel they are trying to kindly humour him, and this helps bring over a strong sense of reality. The difficult decisions and gradual acceptance of the unavoidable are also well handled, particularly by Andre’s daughter Anne, sensitively played by Kerry Peers. 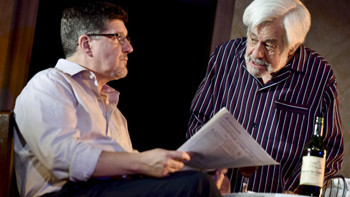 Kenneth Alan Taylor gives a splendidly solid performance as Andre, the subject of the play, bringing a range of emotions to the part as we are shown how dementia is a lot more than just a progressive loss of memory. Andre struggles to maintain a sense of dignity whilst his imagination creates terrifying realities. Having turned 80 earlier this year, the actor brings enormous empathy to his character and it was quite disarming when he emotionally addressed the audience out of character after the final bow. Kenneth Alan Taylor first came to Oldham as a young actor in 1959 and ran the Coliseum for a time in the early 80’s. A role of the magnitude of Andre certainly provided a fitting return for him to the Oldham stage. The style is not simply straight drama and the audience is kept on their toes as the real and imaginary worlds are sometimes blurred. It is not difficult to see why Zeller sites Harold Pinter as one of his great influences but fortunately, we are not left with some of the incongruities which typify Pinter’s work. There is a clear reason for everything depicted in ‘The Father’. The dreamlike style of David Lynch is another influence to whom Zeller gives credit, which might explain why at times we are taken into Andre’s mind rather than just seeing his world from the outside. This gives the play a very personal touch and helps us feel with Andre rather than just sympathise as outside observers. Mention must be made of the physical production, which was one of the most imaginative I have ever seen at Oldham. The setting is both complex and minimalist using to full advantage the full depth and width of the considerable stage area. To say any more would be to spoil a few surprises, suffice to say that the overall effect is an object lesson in stagecraft. Just watch the play and you will see what I mean. 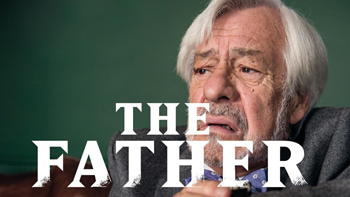 The artistic achievements of ‘The Father’ help make this a very relevant play. There are numerous productions which might highlight the plight of a disadvantaged minority or social group but often as not, the vast majority of the audience will probably have no interaction with the issues or situations depicted. With dementia, it is different because with an ever growing proportion of the elderly in society living longer, this is an issue which we cannot expect to remain immune from. We might be lucky not to experience dementia personally or through a close relative but it is an issue which society has to address, with no known cure at the moment and the amount of sufferers inevitably due to increase. A powerful play, superbly presented. ‘The Father’ runs at Oldham Coliseum until 1st July.